You can follow the progress of the submission process by clicking on Submissions in the assignment page. There, you can see which students have submitted solutions, and for each submission you can see the grades it has received from the reviewers. You can sort the submissions in order of average grade, or (particularly useful) in order of average disagreement between the reviewers. You can also see if the reviewers and submission authors discussed the submission among themselves. In crowd-sourced grading, every participant sees only a handful of the submissions, making it hard to detect similar submissions and possible plagiarism or cheating. 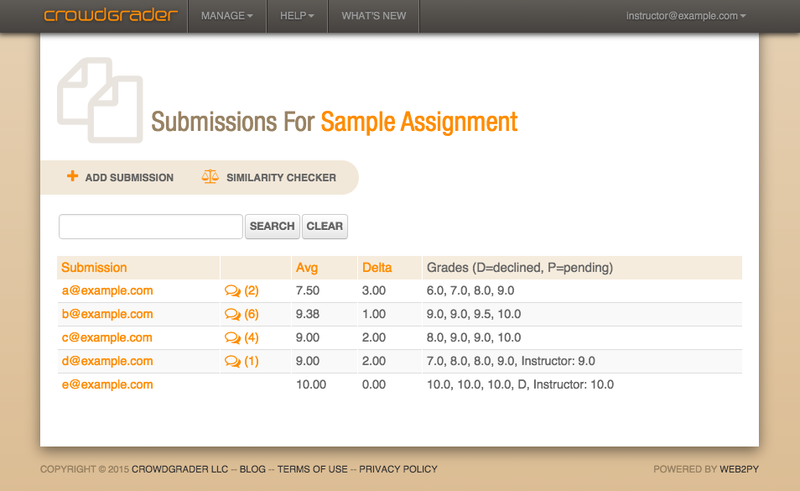 CrowdGrader now has a similarity checker that computes the similarity of submissions, and displays both the the clusters of similar submissions, and side-by-side submission comparisons.